Roulette Strategies - which roulette strategy offers the best results? Roulette Strategies: which roulette strategy offers the best results? Which Roulette betting strategies offer the best results? Lots of Roulette players like to play the beautiful game of Roulette with a Roulette betting strategy. Although a fail-proof, winning Roulette strategy that is profitable in the long run does not exist, applying the right Roulette strategy can increase your chances of winning. What most players fail to realise, is that some Roulette strategies are better than others. And some strategies are better suited for defensive players while another approach will be more beneficial to offensive players. We had made millions of simulated calculations before we came to our findings and firmly believe this information cannot be found elsewhere on the web. These Roulette betting strategies can be applied at land-based casinos, live dealer casinos and online casinos. 1.1 Roulette – why is Roulette so appealing? Since it is purely a game of chance, it can indeed be enjoyed as players do not have to learn and implement complex gaming strategies. Roulette is a game loaded with betting options, and boisterous, adventure-loving gamblers surround Roulette tables. As the game is as entertaining as it is exciting, it is easy to find yourself completely absorbed by this classic table game. Players should take extra care to ensure that they do not exceed their bankroll limits. 1.2 Why do you need a Roulette Betting Strategy? It is most important (as with most other games) to have a clear game plan. If you play without a clear idea, you run the risk of ending up with too many unnecessary losses. To give you an example: do you increase your stake after you have lost? Alternatively, do you choose to do so, after you have won? The financial impact can be huge. How much is the maximum amount am I willing to stake (how high is my limit)? How much do I want to win? At what point do I stop playing? Which Roulette betting strategy fits my playing style and personal goals the best? Especially the latter question is fascinating. There are many famous Roulette betting strategies. Some are much better than others! 1.3 Which Roulette strategy leads to the best results? There are countless websites giving explanations of the Roulette betting strategies: how do these methods work. The single most relevant question “which betting strategy generates the best results” is not answered by anybody. We have decided to crack this nut for you. It was not easy, but we did it. After tens of thousands of complex calculations our test came up with some spectacular results, that will inform, educate and even surprise the most skilled and experienced Roulette player. WARNING! This is not your standard, run of the mill, roulette article. In over 7,000 words, we explain in full detail why most popular roulette strategies will fail you, time and time again. Don’t worry, though. You WILL benefit from this article and gain precious new insights. We will show you which roulette strategy offers the highest chance of winning at roulette. As is the case with any casino game, there are rules. How do you play Roulette? What kind of betting options does the game offer? What are the payouts per bet? What about the house edge? First, let’s go through the rules of European Roulette (single zero), American Roulette (double zero) and the dreadful Triple Zero Roulette (triple zero). We also look at a relatively new and extremely popular Live Casino Roulette game: Lightning Roulette. 2.1 How does European Roulette work? 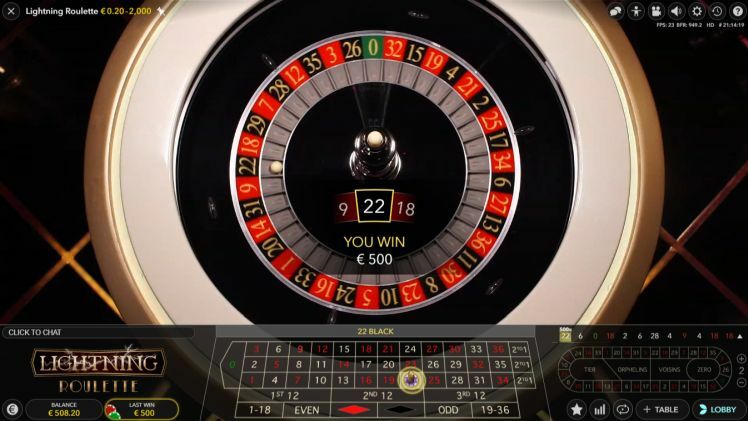 Roulette players are challenged to predict the number, colour of the square, odd/even number, or range of numbers on where the Roulette ball lands at the end of one spin of the Roulette wheel. The ball lands in one of 37 “pockets”, numbered from 0 to 36. Playing Roulette is as simple as placing bets on numbers, a range of numbers, odd/even numbers, or black/red squares and then setting the Roulette wheel spinning in one direction and the Roulette ball spinning in the other. If the ball lands on your number or range of numbers, you win your bet. You have a wide range of betting options to choose from, and they are classified into Outside Bets and Inside Bets. Once you have placed your bet, the dealer (or croupier) spins the wheel. Dependent on the outcome (where the ball lands), you collect your winnings or have the dealer collect your stake (if you have lost). The casino wins over the longer term, as the player loses his stake if the ball lands in the “zero” pocket. On average, it happens once every 37 spins. So, there are 37 potential outcomes. The potential payout is based on 36 possible results. This is how the casino makes a profit (which is called the house edge). 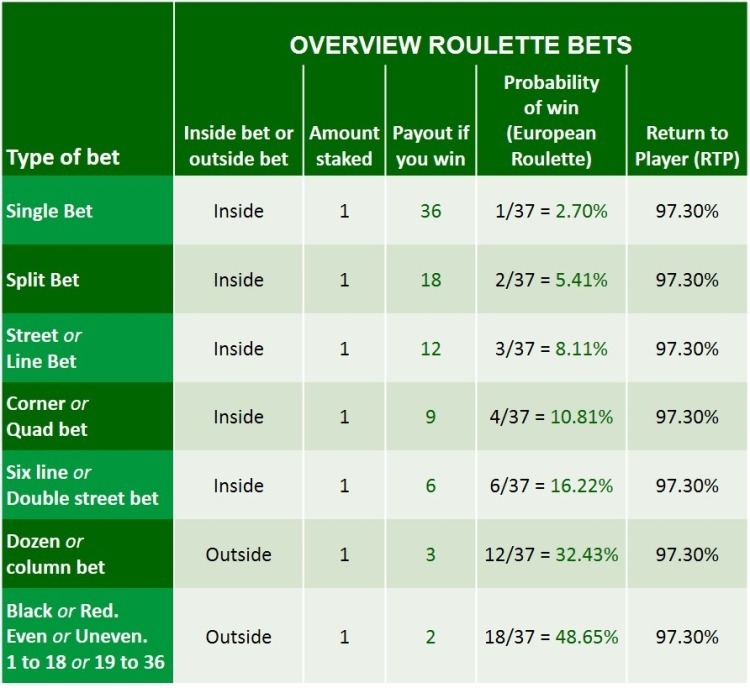 The table below shows the expected payout if you stake $1 (and the probability of winning is for the European Roulette). 2.2 Why is American Roulette less attractive than European Roulette? Even though American Roulette looks and plays the same as European Roulette, there are some significant and important differences. 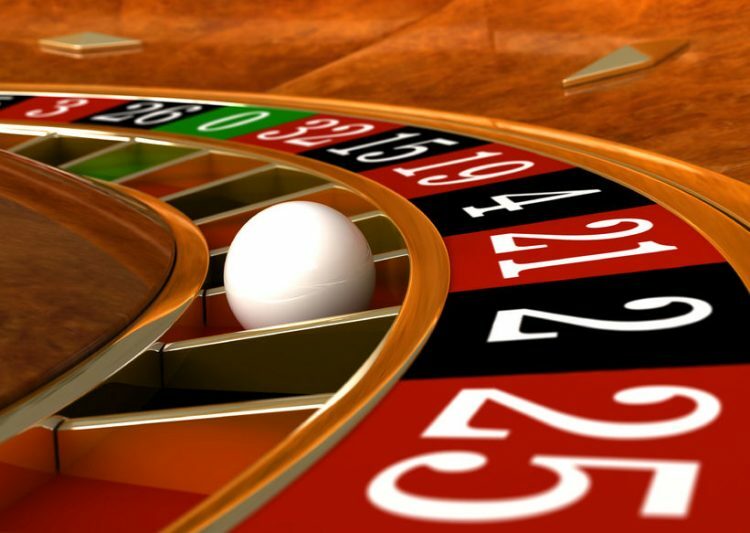 A difference between European Roulette and American Roulette is in the composition of the wheel. The numbers are ordered differently, as shown in the picture below. The main difference is that the American Roulette has a Double Zero (00) pocket, which the European Roulette does not have. The American Roulette has 38 pockets, whereas the European Roulette has 37 pockets. The devil is in the detail: the payout for a win is the same for both European Roulette as well as American Roulette (36 times on a single bet). The difference is that the probability of winning at the American Roulette table is smaller, as there are 38 possible outcomes in American Roulette opposed to 37 possible outcomes at European Roulette. 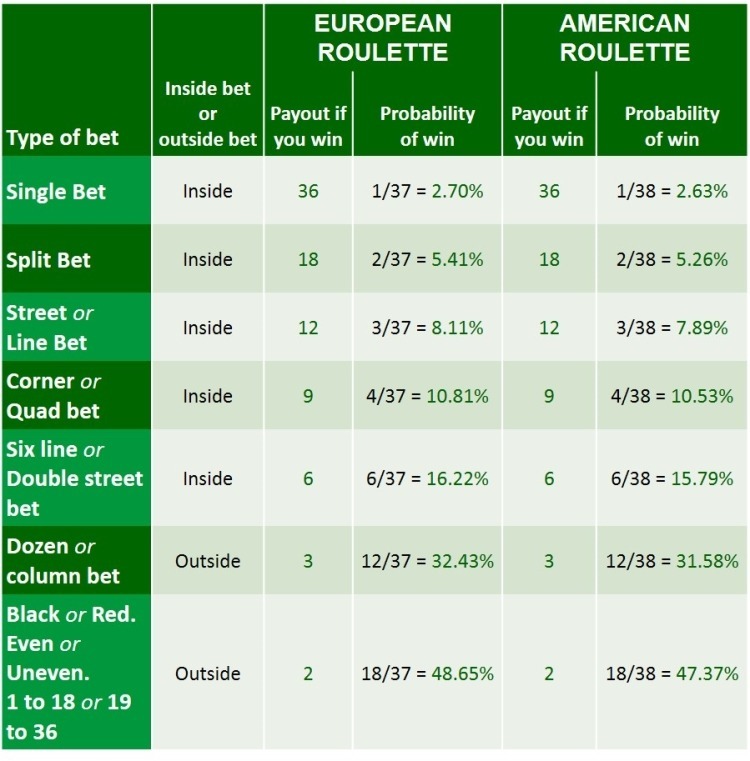 Compare the last columns under the European Roulette and the American Roulette, to check the differences. As everything else is the same, we ALWAYS recommend you to avoid playing American Roulette and play the European Roulette instead. You merely have better odds with European Roulette over American Roulette. 2.3 What is French Roulette and is it better than European Roulette? French Roulette is a variation on European Roulette and offers players an extra advantage. 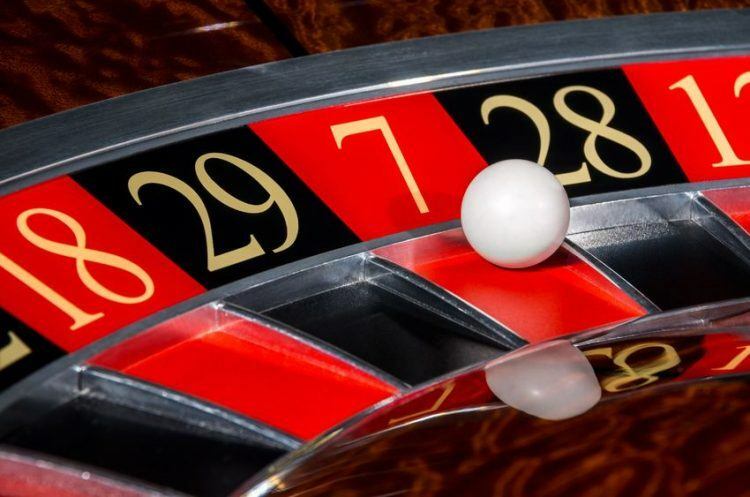 In French Roulette, if the player places an even bet (black/red or even/uneven or 1-18/19-36) and the ball lands in the “zero” pocket, the player only loses half of the stake whereas in European Roulette (and American Roulette) the entire stake is lost. You are best off, playing French Roulette if offered. We always recommend you to play French Roulette, as French Roulette provides the best odds for the even bets. Online casinos rarely offer the French variant of Roulette. The house edge is merely not high enough. 2.4 Why stay away from Triple Zero Roulette? Several land-based casinos have tables with also a “000” (or a triple zero) besides the “00” (double zero) and the “0” (single zero). The new version of Roulette was introduced in 2016 in Las Vegas, and to our surprise, there are still players out there, trying to get their luck with playing the triple zero Roulette. Even worse, it seems to spread in popularity. Even in Downtown Las Vegas, a part of town that is traditionally known for having the best odds, Triple Roulette can be found in most casinos. The triple zero Roulette is even worse than American Roulette. The house edge of Triple Zero Roulette is 7.69%. Always stay away from these tables, unless you are keen to lose money! 2.5 What is the house edge of European, American, French and Triple Zero Roulette? The house edge is a percentage that reflects the winnings of the casino in the longer run. 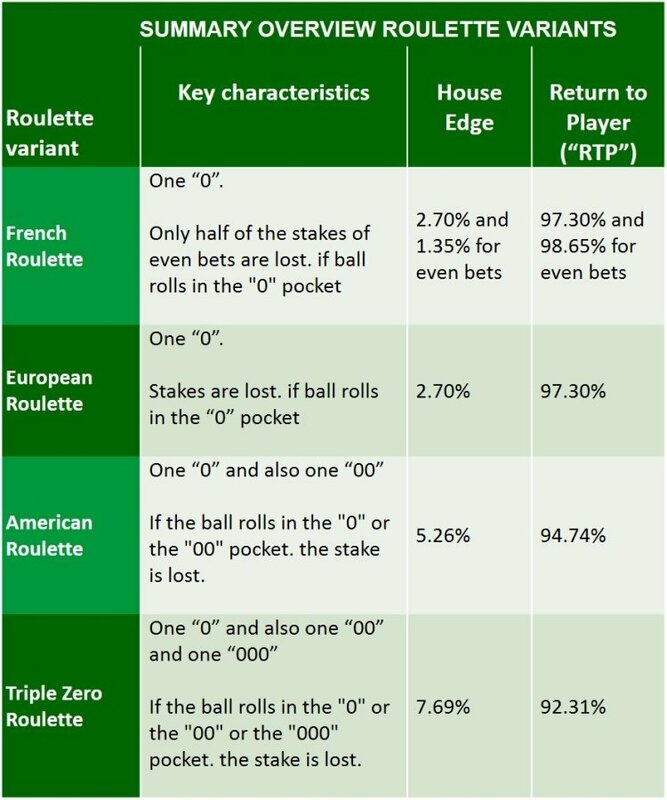 The table below shows house edge for European Roulette, American Roulette, French Roulette and Triple Zero Roulette. 2.6 Why we are basing our best Roulette strategy analysis on European Roulette? In the remainder of this article, we will be focussing on European Roulette only. 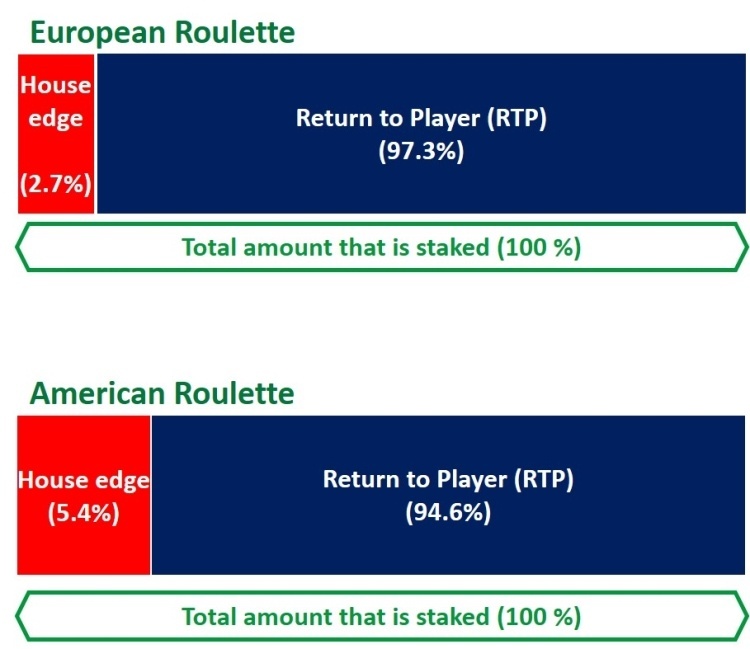 European Roulette offers the lowest house edge and thus, the highest return to player percentage. Most reliable online casinos offer both automated versions and live casino versions of European Roulette. If you play even bets, French Roulette is even more appealing. Unfortunately, online casinos rarely offer French Roulette outside of High Stakes rooms. At the beginning of 2018, Evolution Gaming released a revolutionary new variation on conventional Roulette: Lightning Roulette. This live casino Roulette game offers mystery lightning strikes on up to 5 single numbers with increased multipliers of up to 500 x. Combined with some exciting visuals and “flair” showmanship from the dealer, Lightning Roulette provides a unique and exhilarating live casino experience. Lightning Roulette has proven to be a huge success and was probably the most popular Live Casino game in 2018 (and for years to come). The following 2 steps will help you to determine the ideal Roulette Strategy. Choosing the most appropriate strategy has a very significant impact on your potential winnings. Some strategies are much better than others, in helping you to meet your goal. Our calculations show that the ideal Roulette betting strategy depends strongly on your ambition level. Are you keen to take higher risks for big rewards or would you prefer to settle for lower risks and, subsequently, lower potential winnings? Simply put, defensive players have a different ambition when it comes to the potential profits that can be made compared to offensive players who seek higher potential profits. As a result, defensive players need a different Roulette betting strategy than offensive players. Your goal (with which level of profits you are satisfied with). Are you a defensive player or not? You can use the following questions as a guideline to determine what kind of player you are. How much do I want stake per spin? How long do I prefer to play (how many spins)? You stop playing when either you have reached this target or when you have lost your entire bankroll. You are satisfied, once you have won at least 4 times your initial stake (e.g. you start with $100, and your goal is met, once you have $500 in total available). We understand every Roulette player is different and you might have different goals. However, for the sake of continuity, we must make some assumptions. Several, well known, and often used Roulette strategies can lead to unnecessary losses when used by players with a profile that is not suited to that particular Roulette strategy. 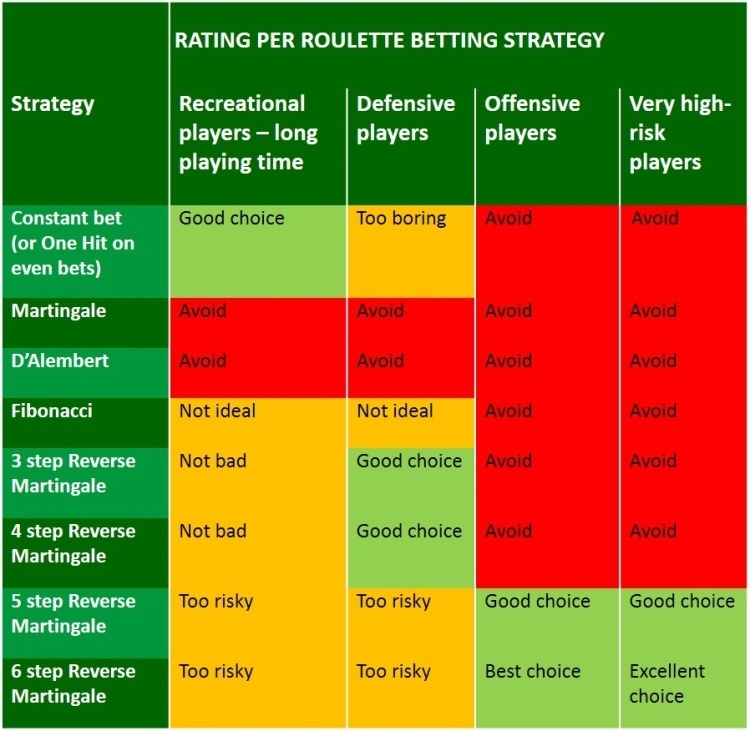 Furthermore, some Roulette strategies are just a bad choice for any player, be it an offensive or a defensive player. Ultimately, it makes a tremendous difference which Roulette betting strategy you choose to play. Do you increase your stake after a loss? Alternatively, do you increase your stake, following a win? Or are you keen to keep your stakes constant for each game you play? Our extensive analysis shows that some Roulette strategies are the worst you can play: they require you to stake more money and have a high casino hold. Other Roulette strategies are much smarter and give you a much better chance of winning. If you are serious about playing Roulette, it is vital to choose the right Roulette strategy. These are the most common and best known Roulette strategies. Most of these strategies are so-called “even bet” strategies. Even bet strategies are strategies that work best with even bets. These strategies are less suitable on bets that are not even (for example betting on a single number in Roulette, the tie bet in Baccarat, several proposition bets in Craps). Even bets, have (almost) the same chance, of occurring and the odds are even (you get paid 2 if you staked 1). In Roulette: The Color bets (Red or Black) or the Even/Uneven bets or the 1-18/19-36 bets. With the Martingale Strategy, you double your stake, once you have lost the previous game. You double each time until you win. Then you start the sequence again. In the end, if you double each time consistently, you end up with a profit. Unfortunately, once you lose 8 or even more times in a row, you could end up in a situation that you do not have enough funds to double the next stake. Besides, you could face limits imposed by casinos. The Reverse Martingale Strategy works in the exact opposite way. You double your stake if you have won the previous game. If you have a winning streak, this strategy is very appealing. The Fibonacci Strategy is comparable to the Martingale Strategy, but the increments of increasing the next stake (after a loss) are not as steep as the Martingale Strategy. It is less progressive and less risky than the Martingale Strategy. In the D’Alembert strategy, you increase your stake with 1 unit (say 1$) after a loss. After a win, the increment decreases with 1 unit. The stakes become much higher in the case you have lost more times than you have won. The idea is that you can make up for the previous losses, with the higher stakes. The Constant Bet strategy is the most straightforward strategy of all. You first determine the ‘unit’ (for example $1), a bet size that is any amount you prefer. Afterwards, you always stick with the same amount on your next bets. Regardless of whether you have won or lost your previous bet, you always place the same bet. The Constant Bet strategy is straightforward. Another pro is that it is not so progressive. Our extensive calculations show that this strategy is ideal for recreational, conservative or defensive players who choose to limit the risk and extend the playing time. The One Hit Wonder strategy works very straightforward. Each time, you bet on the same (combination) of numbers. In the next chapter (Chapter 4), we will discuss in detail how each strategy works and what the pro’s and cons are for each different Roulette strategy. The Theoretical RTP or the House Edge. 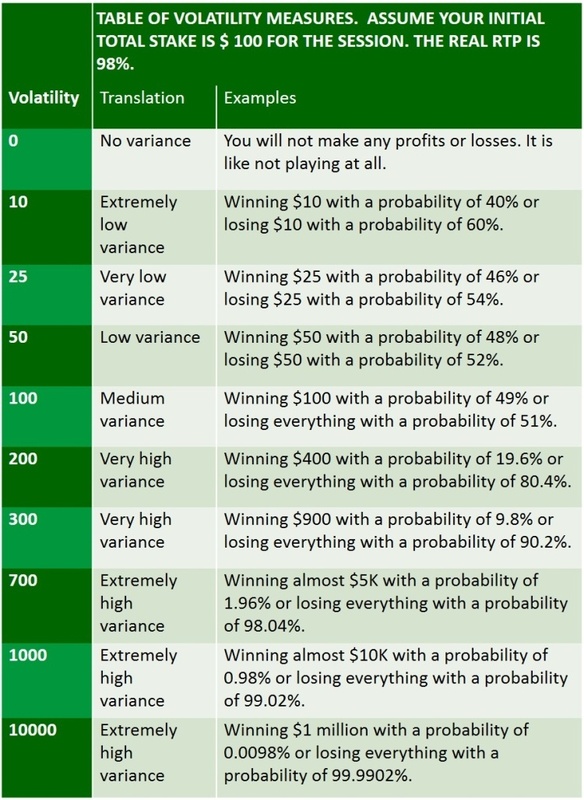 The probabilities assigned to each cohort of profits/losses. This is a so-called Probability Distribution Function. 4 Measurement criteria: How do you decide which betting strategies are the best? How do you measure which betting strategy yields the best results? Below, we list the 4 key measurement criteria (statistics) that are used by players, to determine how good or how bad a strategy works. Measurement 4: The probabilities of winning and losing certain amounts of money (or the so-called Probability Distribution Function). Below, we go into more details, how you can use these measurement criteria. The House Edge of the casino is a term that most of you are familiar with. The House Edge is defined as the casino winnings in the longer run. It is a percentage calculated as the winnings of the casino divided by the amount staked. For example, for European Roulette, the House Edge is 1/37 (2.70%). For American Roulette, it is 2/38 (5,26%). With European Roulette, for every staked $100, the casino earns $2,70 and pay out $97,30 on average (in the longer run). The House Edge is the profit margin which casinos earn in the longer run. It is the betting margin that players lose on average. Casinos need it, to cover the costs of organising the Roulette games (software costs, costs of collecting and paying money, costs of marketing or any other expenses). Additionally, casinos aim to make a profit. If you play Roulette every day for your whole life, you can expect to pay the casino 2.70% over the total amount you have staked. On average you get paid out 97,3% of your staked amount. It is also called the Theoretical Return to Player (Theoretical RTP). The sum of the House Edge and the Theoretical RTP is always equal to 100%. The lower the House Edge, the higher the Theoretical RTP, the better it is for you as a player. It is a helpful statistic that helps you choose which game you should play. 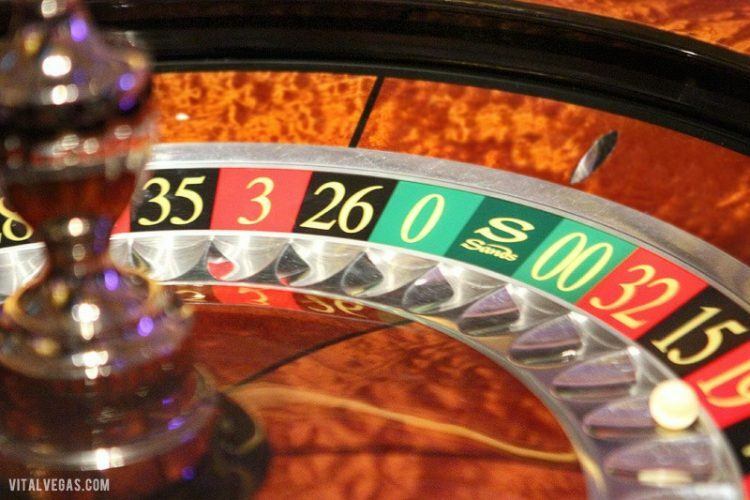 In the case of European Roulette versus American Roulette, the choice is dead simple. How often have you not experienced or seen that players leave the casino empty handed? Unfortunately, more often than you hope for. Why does this happen, if the House Edge of, for example, European Roulette, is only 2.70%? This is because you have staked much more than the $100 you brought with you. Over the whole session, you stake $2000. The expected casino profit (ON AVERAGE) amounts to 2.70% multiplied by $2000 = $54. The amount paid back (ON AVERAGE) is $1946. The casino’s House Edge is 2.70% ($54 over the total amount staked $2000). The Casino Hold is 54% ($54 of $100 which was your bankroll). The Real Return to Player (Real RTP) is a mere 46% of the $100. The example shows us that it is best to stake as little as possible, for example, by finding a strategy where $200 is staked instead of $2000. As you can see, the more you stake, the higher the expected losses are. It is essential to find a strategy where the staked amount is relatively small. If you stake $3700 or more on your session (with a budget of $100), the expectation is that you lose your entire sum of money ($100). 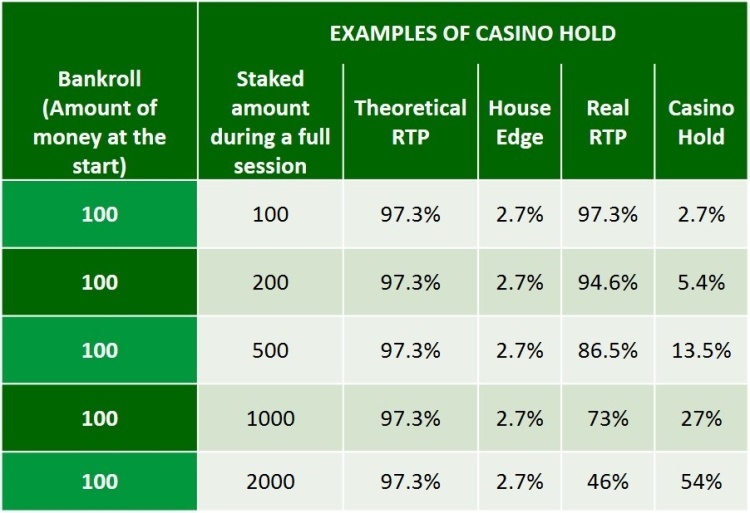 The more progressive betting strategies (such as Martingale or D’Alembert) do not have an appealing Real RTP. Simply put, these progressive Roulette strategies require you to stake much money so that you end up with higher losses. The Volatility (as a measure of the variance) is an indication of how widespread potential wings or losses are. The higher the Volatility, the higher the chances of winning more substantial sums of money. The probability of losing more money (or even your entire initial deposit) also increases. Assume your initial total stake is $ 100. The chance of winning $10 (ending up with $110) is 49%, and the likelihood of ending up with $90 (loss of $10) is 51%. In this example, the volatility is low. There is no chance of winning a massive amount of money. The Volatility is higher if you can win $100 (end up with $200) with a 49% chance or lose everything with a 51% chance. The Volatility would be very substantial if, for example, you have a probability of say 5% to win $2000 and have a chance of 95% of losing everything. The more risk you take, the higher the Volatility. Defensive players like to have moderate Volatility. For example, they are satisfied with $50 in profits. At the same time, they aim to avoid losing the entire initial stake ($100). There are also many offensive (risk-taking players) who prefer a higher game Volatility. They are keen to take a shot in winning $1000 or even more, while they only have an initial bankroll of $100. Those players are keener to play a risky game with a higher variance. They accept that losing the entire initial stake is more than realistic. 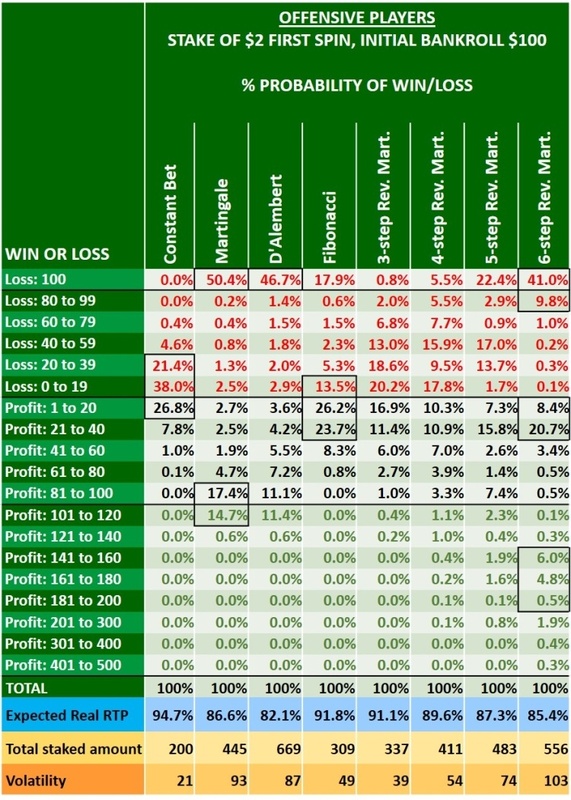 If it is easy to afford to lose the entire initial deposit (of say $100), it makes more sense to opt for a higher variance strategy which leads to potential higher winnings. If you need to keep some extra cash and cannot afford to lose your initial stake of $100, we strongly recommend you to choose a more cautious strategy with low variance. The upwards potential is much less in that case. The most common way to express the variance is by using the Volatility measure (or Standard Deviation). The table below shows some examples, where the ratio of volatility is translated intuitively. Defensive players should aim for volatility of around 25-50. Offensive players typically would like to have a volatility of 100-200. Slot players aim for volatility in the range of 400-1000. If you play a lottery with a high jackpot, you aim to win it and know that the probability in doing so is almost zero. The volatility of a lottery could be as high as 10,000. These examples give you a guideline. If you take the volatility of a strategy (we have calculated these for each of the betting strategies) into consideration, it will help you to decide if it fits well with your style of play. Too often, we see players base their decision (on which strategy to play) on the theoretical RTP only. Interestingly enough, the theoretical RTP is only part of the story. Would you, for example, not be interested to know your chances, of making a large profit? Alternatively, the probability that you leave the session empty-handed? Your stake in the first spin is equal to $2. You have an offensive mindset: you only decide to stop playing when you have won $400 or more (or when you have lost your entire $100). We have made the calculations for 8 strategies. The table below shows the results of our calculations of all the probabilities. 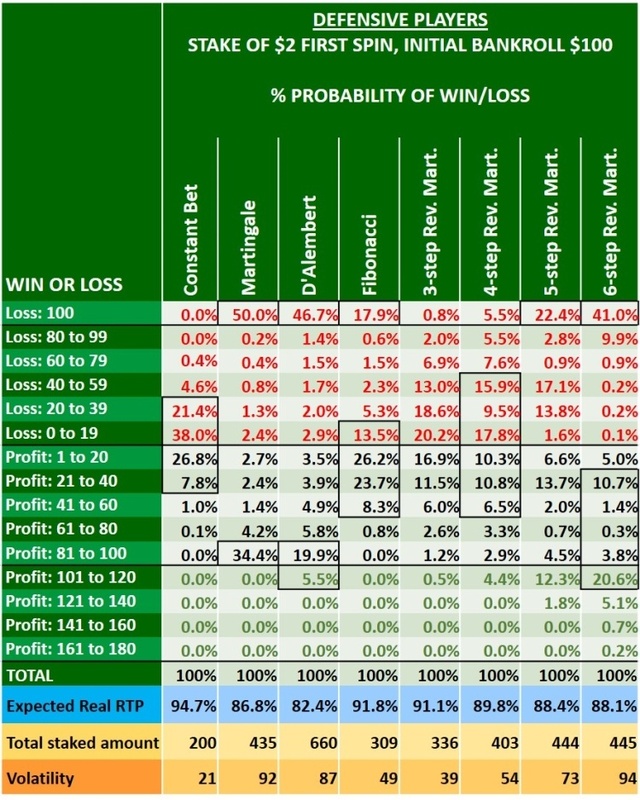 The expected Real RTP of the Constant Bet strategy is the highest (with 94,7%). Unfortunately, the volatility is the lowest. The chance of losing your total $100 is zero. Winning anything more than $60 is also virtually zero. 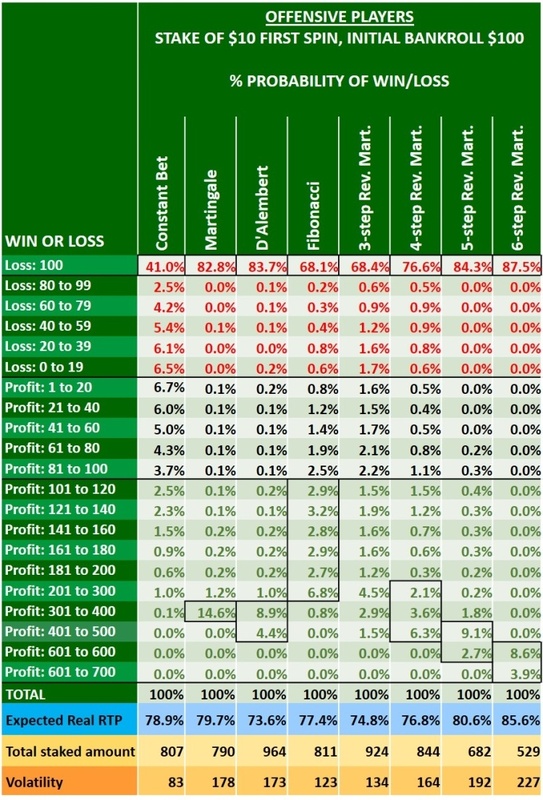 The table shows that the probability is in total 86.2% (21.4% + 38.0%+ 26.8%) that you have less than $20 profits and also not more than $40 losses). Despite the Constant Bet strategy having the highest Real RTP, it is a pretty dull strategy with no upward potential. The volatility is a mere 21%. The Martingale strategy has a much higher variance: and is also quite extreme. The chance that you end up with nothing is 50.4%. Chances that you have profits between $80 and $120 are 32.1% (17.4% + 14.7%). If you have higher ambitions and aim to increase your winnings, it is better to play the 6-step Reverse Martingale Strategy. You have a fair chance of winning more than $140. The probability of losing the entire initial stake is a hefty 41.0%. Which betting strategy is the best? Do you play for fun, without taking too many risks? In that case, the Constant Bet strategy is ideal for you. Do you prefer massive potential profits? Accept the fact that you could end up empty-handed? In that case, the Reverse Martingale Strategy is much better. It is, fascinating to see that the Martingale Strategy is very risky, even though many players regard it as a safe and a “cannot fail” strategy. These tables (probability distribution of profits/losses) help you to choose the preferred strategy when playing Roulette. These tables provide precious insight into your chances of winning certain amounts (interval of certain amounts). 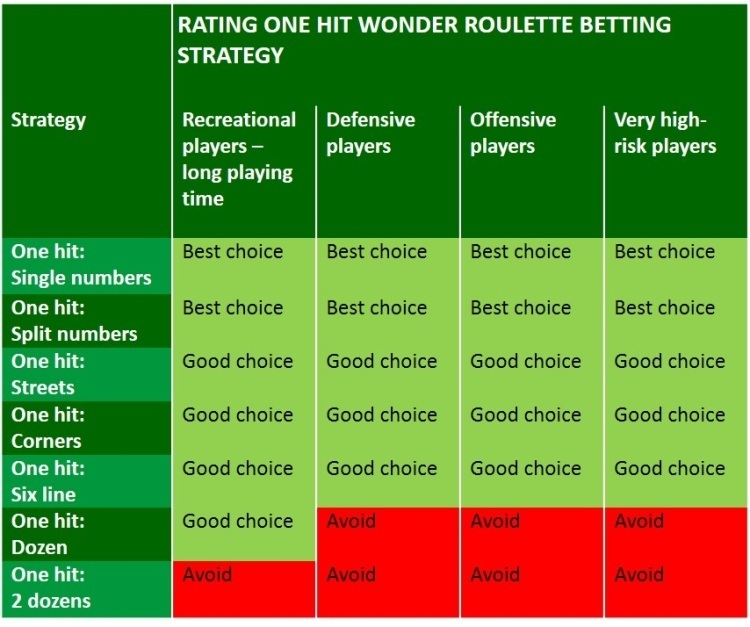 It allows you to see the full picture of the risks and opportunities for each different Roulette strategy, while measures such as the Theoretical RTP only tell you something based on the long-term average. 5 STEP 2: Which Roulette betting strategy works best for defensive players? If you are a defensive player, some Roulette strategies work better than other approaches. Before we can start doing our calculations, we have to set some rules. You are a defensive player, and you are satisfied once you have won $100 (once you have $200 available). We have selected 8 strategies for even bets to start with. Below, you can see the results of our calculations. The stake is $1 on the first spin. We have calculated (with the random generator of 1 million Roulette sessions) the probability of obtaining a certain amount of winnings (or losses). 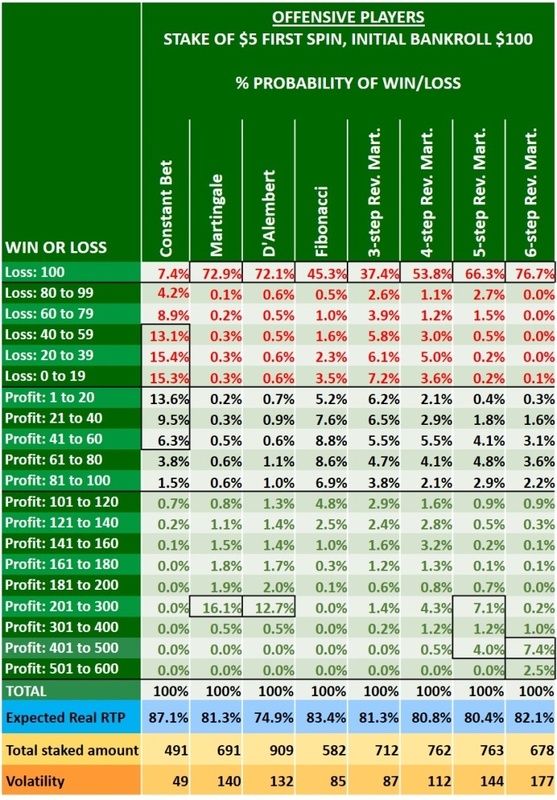 The Constant Bet strategy has the highest Real RTP (97.3%). The Volatility (the measure of variance) is very low though. You end up (most likely) with a tiny loss or a very moderate win. It is the ideal strategy if you seek entertainment. It is perfect for recreational and cautious players. If you are a more aggressive player, it is not the preferred strategy. The Martingale strategy is defensive and prudent, right? Not. The chance of losing everything is 33.3%. The likelihood is of making a profit is 61%. The Martingale strategy has the highest variance. The D’Alembert strategy is pretty aggressive. The probability is 25.2% that you leave empty-handed. It becomes progressive as the stakes increase over time. The result is that you get high losses. The Real RTP is the lowest with only 87.2%. We do not recommend this strategy. The Reverse Martingale strategies are interesting. These strategies (especially those where you bank after 5 or 6 consecutive wins) have an excellent upwards potential (the chance that you win more than $100 is 7,1%). In the worst case, your losses amount to $60. So still enough money left to take a taxi home. We do not recommend the Fibonacci strategy: there is not much upwards potential. There is even a small chance that you lose your entire initial stake. The graph below summarises the results. The blue bars represent the Real RTP, the orange line the variance is, of each of the strategies. 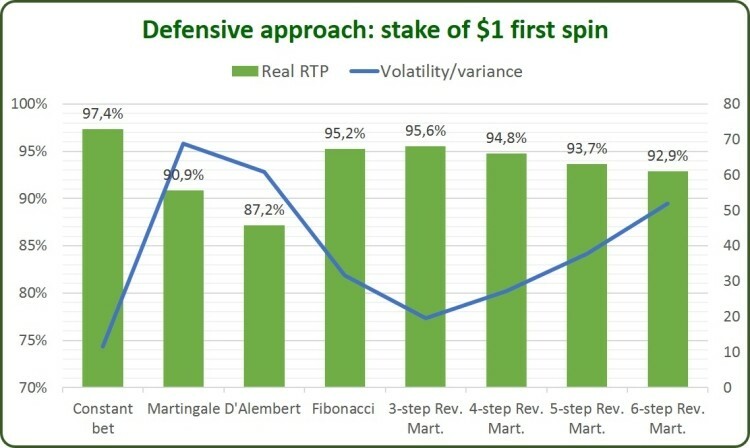 You see that strategies with higher Volatility (or variance) usually have a lower Real RTP. Below you see the results of our calculations. The stake is now $2 on the first spin. The picture here is not much different to the results with stake $1 on the first spin. The Martingale and D’Alembert strategy have a significant probability of you ending with zero. Besides, these strategies have the lowest Real RTP. 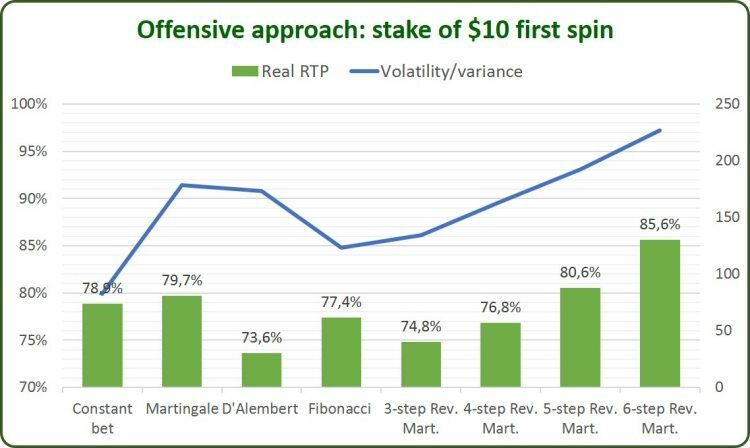 The Constant Bet strategy has the highest Real RTP and the lowest Volatility (variance). The chance of winning anything significant is zero when you follow this strategy. The Reverse Martingale strategies are appealing: the chances of you leaving empty-handed are small (unless you opt for the 6-step Reverse Martingale). The upwards potential is significant. The Real RTP’s are lower when the stake of the first spin is $2 instead of $1. You are doubling the bets and taking more risk. Potential winnings increase. Unfortunately, it comes with a price. 5.4 Which even bet Roulette strategies are the best for defensive players? The strategies which suit defensive players best are the Reverse Martingale strategies. In those strategies, you double your stake until you have won 3,4,5 or 6 consecutive times. If you are extremely cautious, stop increasing your stake after 3 wins (you apply the 3-step Reverse Martingale Strategy). If you seek some upwards potential, you better choose the 5-step or 6-step Reverse Martingale Strategy. As you are defensive, we recommend you to have an initial stake of $1 maximum $2 (if your entire wallet amounts to $100 at the start). The Real RTP’s are better for the strategies where you bet $1 on your initial stake. 5.5 Which even bet Roulette strategies are the worst for defensive players? Serious risk-averse players, who aim to reduce the chance of losing your entire stake, should stay away from the Martingale strategy and the D’Alembert strategy. These strategies have a high chance of you leaving the casino empty handed. The real RTP of these strategies is also the lowest. 6 STEP 2: Which Roulette betting strategy works best for offensive players? Different Roulette strategies are best suited for different types of players. If you are an offensive player, you need to know which strategy works best for your player profile. Before we can start crunching the numbers, we must set some rules. You are an offensive player, and you are satisfied once you have won $400 (once you have $500 available). The maximum number of spins, in any case, is 100. The stake of your first spin is either $5 or $10. Below you see the results of our calculations. The stake is $5 on the first spin. The Constant Bet strategy is relatively safe, and the chances of losing everything are not too high. Unfortunately, the chances of winning anything more than $160 is zero. Avoid this strategy if you are a risk taker. The Martingale and D’Alembert strategy have a significant probability of you ending with zero: probabilities of 72.9% and 72.1%). Chances of getting a profit higher than $300 are minimal (less than 1% for both strategies). 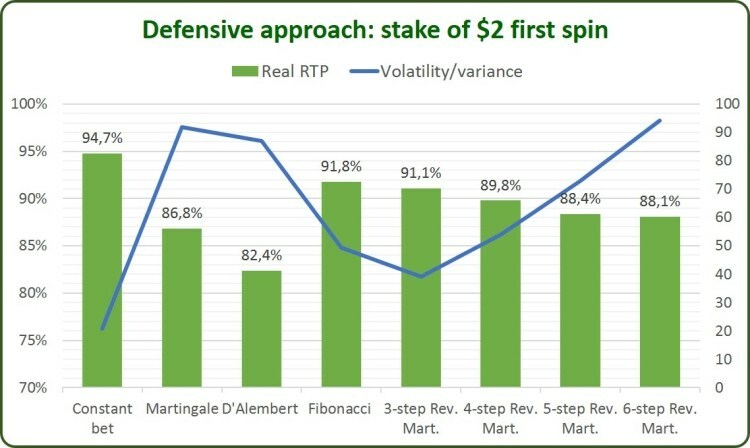 The Real RTP’s are 81.3% for the Martingale Strategy and a pathetic 74.9% for the D’Alembert strategy. We do not recommend these strategies. Instead, we recommend the 5-step of the 6-step Reverse Martingale strategies. Whereas the real RTP’s are not much higher than that of the Martingale strategy, there is a fair chance that you win more than $400. The results with $10 on the first spin are similar to those with $5 on the first spin. However, you run more risk. You see that the Real RTP are lower for most strategies. There is one real exception. 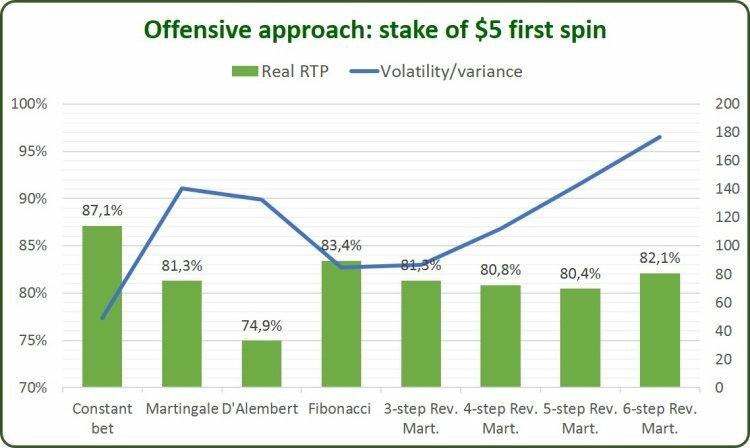 Looking at the 6-step Reverse Martingale strategy (banking after 6 consecutive wins), you see that the Real RTP is 85.6%, which is much higher than all the other Roulette strategies. You have a fair chance of 12.5% (8.6% + 3.9%) of getting yourself a profit of $500 or more. The downside is that the probability is 87.5% that you end up with nothing. 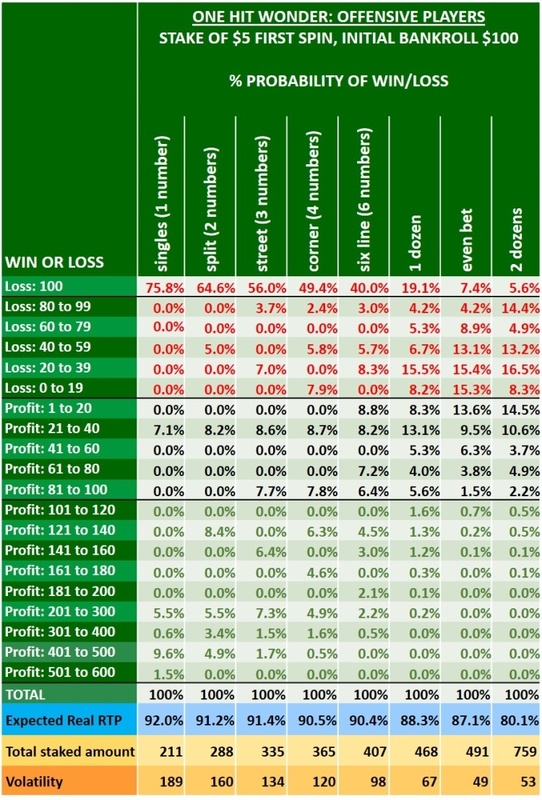 This strategy suits well if you can afford the $100 loss, especially compared to the other strategies. 6.4 Which even bet Roulette strategies are the best for offensive players? We conclude that the 6-step Reverse Martingale strategy is the best strategy for you, assuming you are a risk taker. If you decide to go for it, you better stake $10 on your first spin (10% of your initial deposit of $100) rather than $5. 6.5 Which even bet Roulette strategies are the worst for offensive players? The Fibonacci strategy does not work well with stakes of $10. 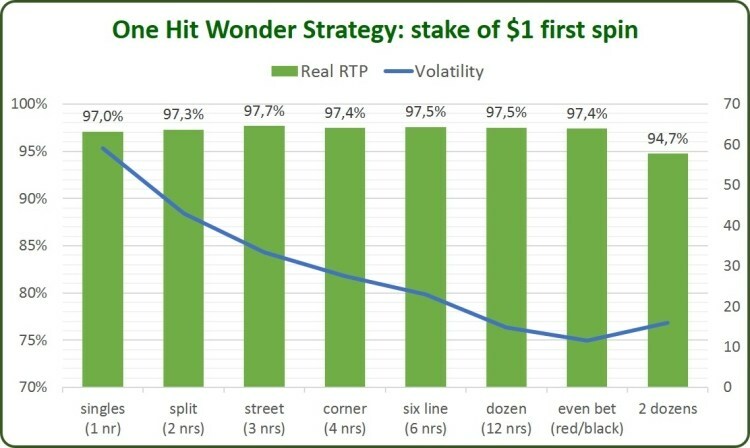 Betting on single numbers (or several numbers) are sometimes also referred to as the One Hit Wonder strategies. These strategies are not the same as even bet strategies, which you have when you play on Black/Red or Even/Uneven or 1-18/19-36. As the probability of hitting a single number (or a split or street) is much smaller, the bet is by definition not an “even bet”. If you are keen on taking more risk and also hoping to make more money more rapidly, betting a subset of numbers might not be a bad idea. The results are pretty good! 7.1 Playing assumptions for the One Hit Wonder strategy for defensive players. Again, we have made some realistic playing assumptions before doing the calculations. The stake of all of your spins is $1. The exception is for betting on 2 dozens, where you stake $2 per spin. 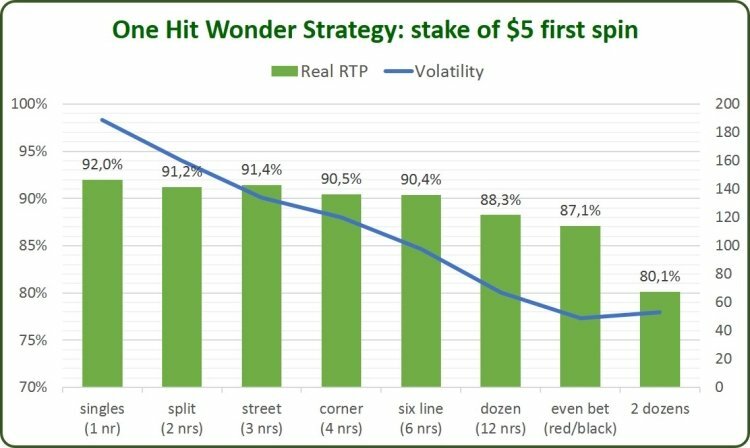 The results show that the Real RTP of all the One Hit Wonder strategies is high and much better than several of the even bet strategies. 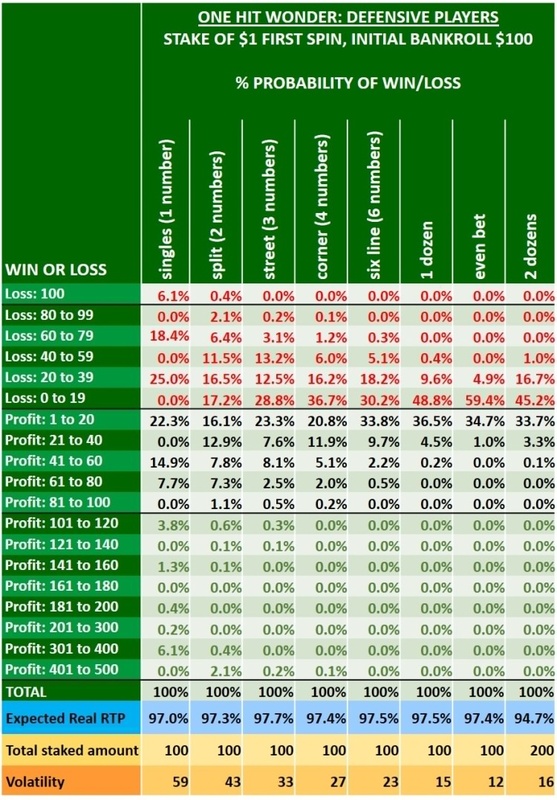 The reason is simple: the total staked amount during a session is much lower ($100) than with most of the even bet strategies, where the stakes increase over time. The good news is that when you bet on single numbers or split numbers (2 numbers), there is a good upwards potential. It is great to see that the chances of leaving the session empty-handed are minor. 7.3 Is the One Hit Wonder strategy suitable for defensive players? Betting on single numbers (or splits or streets) is a very effective strategy for defensive players. 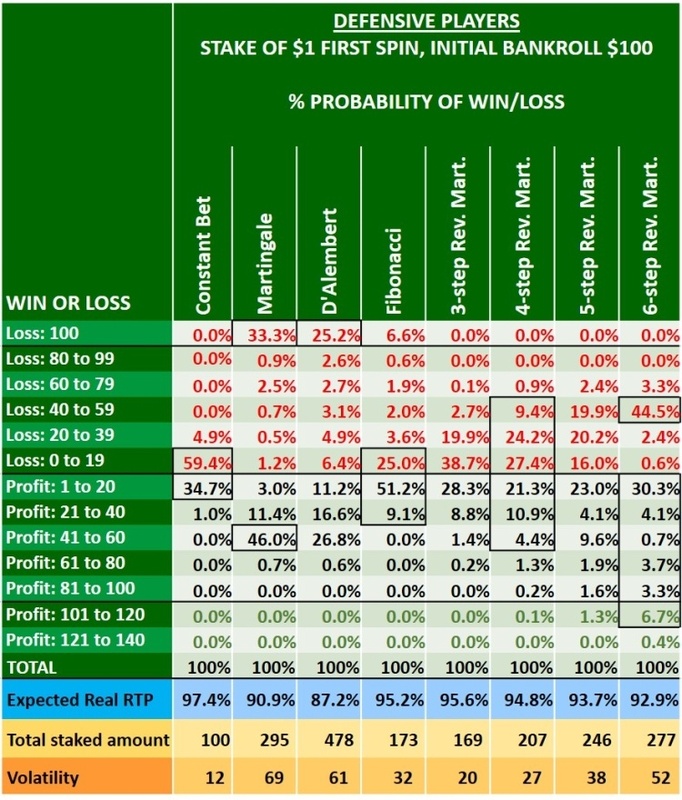 The real RTP is 97,3%, as you turnover more than $100 if you stake $1 per spin. Betting on 2 columns should always be avoided. The results of the One Hit Wonder strategy are pretty good! 8.1 Playing assumptions for the One Hit Wonder strategy for offensive players. When the stake is increased to $5, the risk increases substantially. Betting on singles, splits, streets or corners leaves you with high chances of losing the entire initial stake of $100: 75.8%, 64.6%, 56% and 49.4% respectively. The main advantage is that the strategies have great upwards potential. Betting on 2 columns should always be avoided: you turn over too much, and in the end, the casino earns the house edge on your turnover. The casino hold is too high. The upwards potential is not there either. Conclusion: stay away from betting on 2 columns or 2 dozens. 8.3 Is the One Hit Wonder strategy suitable for offensive players? When you bet on numbers at $5 per spin, you are taking more risk. These strategies are effective and lead to good upwards potential. We recommend you to bet on singles, splits, streets or corners, to get the highest upwards potential and the best real RTP’s. 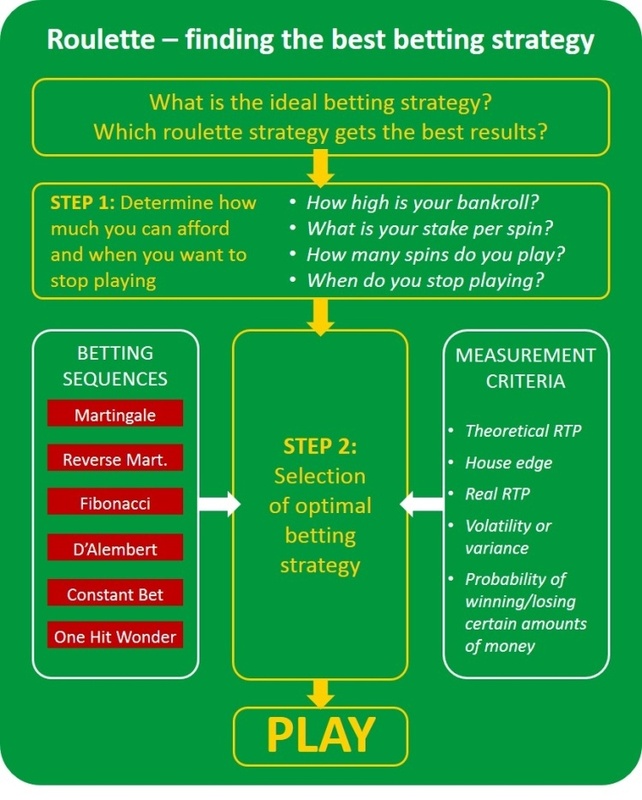 9 STEP 2: Summary – which Roulette betting strategies have the best results? Finally, we are getting to the best part. If you have made it this far: this is the part where we give an overview of which Roulette betting strategies provide the best results. The big finale, if you wish. Be advised these conclusions only portray the statistical results for each strategy. They do no guarantee you will win every time. Nor do they guarantee winning over a more extended period. Please see gambling as a form of entertainment, not as a way to increase your income. Below, we summarise our conclusions on the appropriateness of the betting strategies we have evaluated. We have taken defensive as well as offensive players into consideration. Or, in other words: which Roulette strategy is most suitable for what type of player? We conclude that defensive and risk-averse players are also best off with the One Hit Wonder strategies on singles, splits, streets, corners. The Reverse Martingale strategy (3-step or 4-step) also works pretty well. 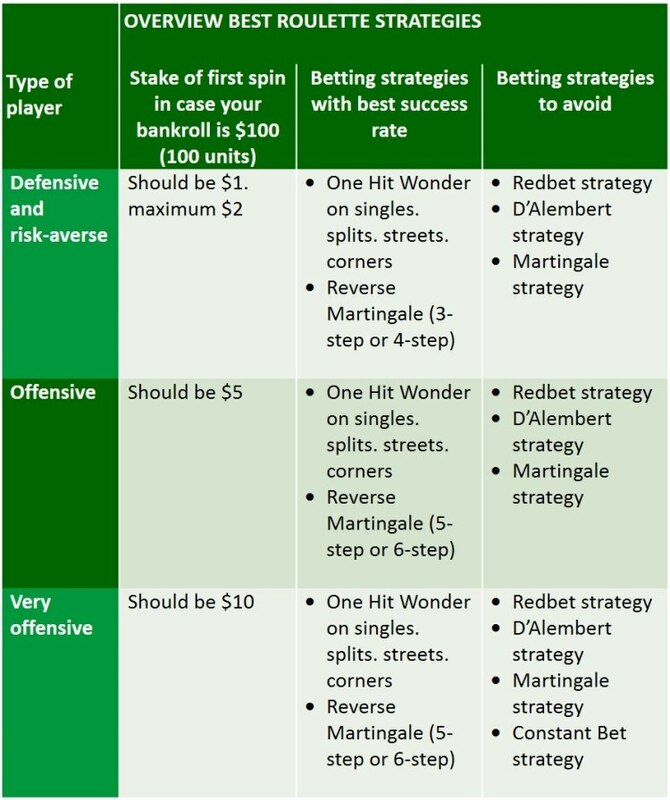 The ideal Roulette strategies for offensive players are the One Hit Wonder strategies on singles, splits, streets, corners and also the Reverse Martingale strategy (5-step or 6-step). The Constant bet strategy (always the same stake on even bets) is not volatile enough and does never lead to the desired level of winnings. The table below provides further details by betting strategy. It is interesting to see that the famous Martingale strategy is not recommended. It only works in a hypothetical world where you have an unlimited bankroll and where casinos do not impose limits. Theoretically, the Martingale strategy works, but not in practice! And who thought that the simple One Hit Wonder betting strategy (on singles, splits or streets) would yield the best results? For both defensive and offensive players? The explanation is simple as well. As you do not stake a large amount, the risk exposed to the casino is limited. As a result, the casino hold is low, which is great for you, as a player! We performed our calculations by carrying out 1 million Roulette sessions of 100 spins. We used a random generator to spin 100 numbers (the length of a session). We simulated 1 million runs per strategy. For all of these 1 million sessions, we calculated the result, would one of the strategies have been applied consistently. Afterwards, we counted the financial outcome of each of the strategies: we counted how many times a player would have won or lost and by how much. The winnings/losses. The corresponding probabilities of the wins/losses (in cohorts) for each of the strategies were plotted. For example, if a player has won $200 (or more) in 50 thousand occasions (of the 1 million simulated sessions), we conclude that the probability of winning $200 (or more) is 5%. This is calculated as 50 thousand divided by 1 million, multiplied by 100%.